This week the students learned different aspects of coding. We started the day with our Design Challenge. The students had to work in groups to create the latest and greatest app that will aid in collaboration. 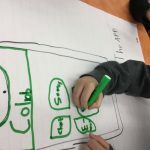 The students came up with ideas that included assisting each other in mini-games, a painting app that allowed two or more students to work together, or an app that put chats, videos, and documents all in one place. 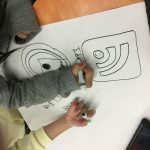 The students had to give the app a relevant name to its features and create a logo. From there, we add the Decimal values together: 64+16+2+1= 83. 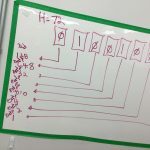 Using an ASCII chart, students would look find the Decimal value and the associated Character, the example being an “S”. They continued to solve different Binary expressions using a flipchart. The students also learned how to convert Decimal notation to Binary using inequalities, specifically greater than or equal to expressions. 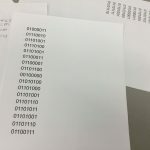 They could create an algorithm to generate the Binary statement. After lunch, the students were guided through the app Hopscotch . 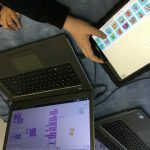 They were shown basic blocks of code that create a pattern on the screen. After the initial pattern was created, a more complex pattern was added on. 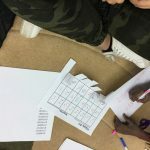 The students had to use their computational thinking skills to break down the task and figure out how to replicate the pattern. 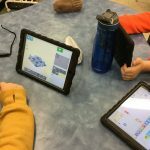 After Hopscotch, students could explore different coding apps. 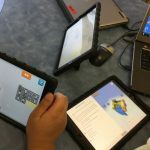 They were allowed to self-select the apps based on their strengths, interests and ability level in coding. The apps ranged in difficulty from beginner to expert. Lightbot and Scratch Jr were two introductory based apps. Swift Playground was an intermediate app. Hopscotch and Scratch Online were two of the more complicated apps. At the end of the day, the students completed their reflections and had to comment where they felt coding could take them.